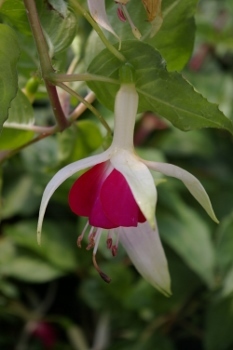 Joy Creek Photo Archive (c) all rights reserved We received cutting wood for this lovely fuchsia from Sally Dahl. Sally has tried to keep us up-to-date with newly tested hardy fuchsias. The beautiful flowers have greenish white tubes with white sepals that are tipped in green. Underneath the sepals, the single corollas are dark fuchsia rose. The white filaments and pitstels are a sharp contrast with the corollas. The mid-green foliage is especially large, up to 3 1/2-inches long and 1 1/2-inches wide. The young stems are purple. Summer to autumn. 18 in. x 18 in.